Experts and pundits predicted that Hispanics would vote in record numbers to express their displeasure with Donald Trump. In Texas, it doesn't look like that happened. Election watchers predicted — and Democrats hoped — that outrage over Republican presidential candidate Donald Trump's disparaging remarks about Hispanics would propel them to the Texas polls in unprecedented numbers. At first glance, it appears those predictions were wrong. Texas saw little overall change in voter turnout in counties that have a larger percentage of Hispanic adults than the state's average. That includes the counties along the Texas-Mexico border and three of the state's biggest counties: Harris, Dallas and Bexar. Turnout in those areas increased by just one percentage point. Because Texas doesn't track voters by race and ethnicity, there's no way of knowing exactly how much of the turnout in these counties, particularly those that don't have predominantly Hispanic populations, was made up of Hispanic voters. But turnout was dismal or fell in some areas where Hispanic adults make up more than 90 percent of the voting-age population. In Webb County, where the share of Hispanic adults is the state's highest at 95.6 percent, turnout slightly increased from 28.5 percent in 2012 to 29.3 percent. Turnout was also up just slightly in Harris County, where the Hispanic adult population is roughly 518,000 greater than in the three biggest counties in the Rio Grande Valley taken together. The two largest border counties, El Paso and Hidalgo, saw bigger increases in turnout. In Hidalgo, where Hispanic adults make up 89.1 percent of the voting-age population, turnout increased from 25.7 in 2012 to 28 percent. In El Paso, where Hispanic adults make up 82.6 percent of the electorate, turnout was up from 29.4 in 2012 to 33 percent. Poor turnout in areas with big Hispanic voting-age populations came even as Trump's support among Hispanic voters was hitting new lows. An election eve poll by Latino Decisions showed 80 percent of Latino voters in Texas supporting Democrat Hillary Clinton while just 16 percent backed Trump. That was down from the 29 percent of Latino voters that on election eve in 2012 said they were supporting Republican Mitt Romney. But low turnout among Hispanics in Texas is nothing new. In the 2012 presidential election, just 27.7 percent of Hispanic adults cast a ballot, according to census estimates. 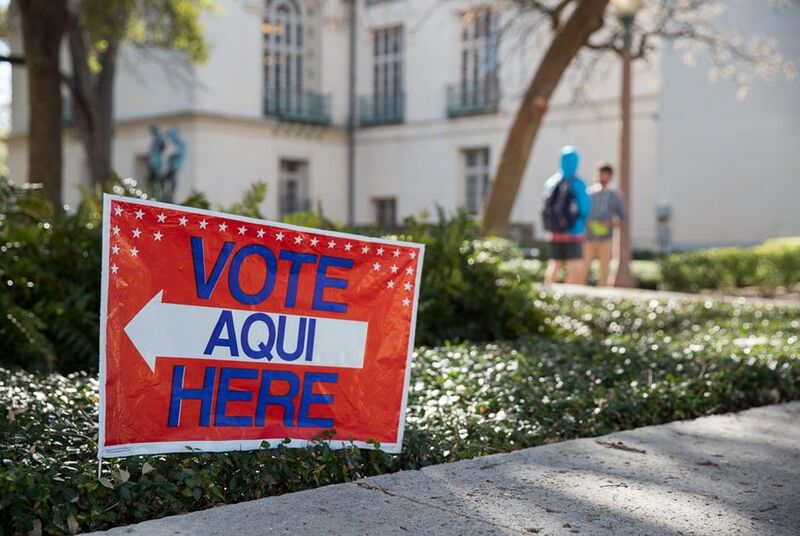 Presidential elections regularly serve as high benchmarks for Hispanic turnout in Texas. By contrast, just 16.2 percent of Hispanic adults voted in the 2014 gubernatorial election. Census estimates for 2016 based on race and ethnicity won't be available for several months. Half of the Hispanic Republicans in the Texas Legislature were ousted Tuesday — two from San Antonio districts and one from Pasadena. Hispanic Republicans in Texas are grappling more than ever with the polarizing candidacy of GOP presidential nominee Donald Trump, whose hardline immigration views powered his campaign throughout the primaries.